This dissertation explores the hidden potential of lingua receptiva (LaRa) – a multilingual mode of communication in which interlocutors speak their own language and master the language of the other well enough to understand what is said to them. This mode is often assumed to be possible only with closely related languages that are mutually intelligible, a situation called inherent LaRa. The novelty of this study stems from the fact that the focus is on acquired LaRa, in which mutual understanding is also possible across language families thanks to advanced second language learning, and that lingua receptiva is studied in an experimental setting. 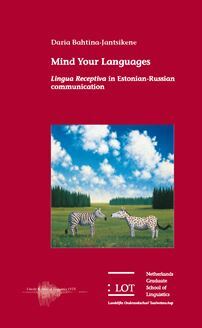 The results show that LaRa involving native speakers of Estonian and Russian is an efficient communicative mode. Pairs of participants managed to create common ground (i.e., reach alignment), especially when they actively monitored the other’s understanding. Communication partners `minded’ their languages through the use of a range of meta-communicative devices, tuned to the communicative demands, and the interlocutors’ combined L2 proficiencies. Importantly, even pairs with limited L2 proficiencies were able to reach mutual understanding, sometimes even `outscoring’ linguistically more advanced pairs. Level of exposure and positive attitudes to L2 appear to promote success. Whenever L2 proficiencies did not guarantee successful communication, alignment was aided by additional means, such as code-switching and relaxing the grammaticality norms. LaRa is recommended as an alternative mode of multilingual interaction. Equipped with plurilingual repertoires and communicative skills, LaRa users can build enough common ground even with quite limited linguistic resources.